By now you probably have figured out that I must be back in New York, even at my slow pace. 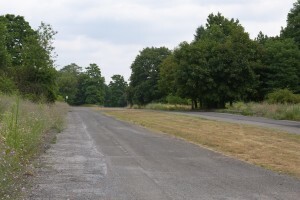 The last stretch of my journey, I like to call it “Alternative Lifestyle”, took me through Pennsylvania from the Bald Eagle State Forest thru Lewisburg, looked like a nice small town, to Centralia. 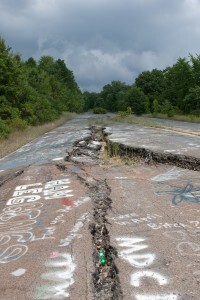 Centralia is considered a ghost town; only nine people live there at this point. 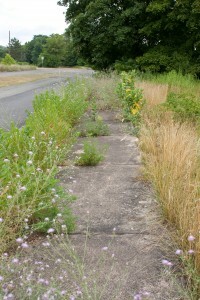 Originally Centralia was a town with a population of roughly 1,100. An underground coal fire that has been burning since the 1960s! is a cause for the exodus. The fire emits unhealthy fumes; even I had difficulties breathing when I went up the hill where you can see smoke and steam coming out of the hillside. However, I had no problems breathing when I walked around the deserted streets of Centralia. In the 1980s the government bought out most of the homeowners and dismantled the homes. All that is left of the town are streets with no names going nowhere, a cemetery and a handful of homes. You can only imagine what this town must have looked like judging by the wide side walks and stone walls, very sad. There are several sites online which give you more details about the local and federal governments’ failures to put out the still burning fires. Centralia - closed hwy 54 due to buckling and cracking caused by the nearby coal fire. Next stop, Pottstown where I visited my cousin Bill. The closer I got to larger towns the less I enjoyed driving. The streets are not build for trucks, they are too narrow and most of the time don’t have a shoulder. Drivers are getting worse too, making left hand turns right in front of me thinking that I can just stop on the spot. Never mind that they don’t let me merge even in stop and go traffic; I was cursing like a truck driver. Did I mention low clearance bridges? There have been several occasions when no bridge height was indicated and my stomach contracted and I stopped breathing as I made my way under the bridge or overpass. My last stop was a visit to a friend in Princeton. I knew that the last stretch of the drive would not be easy. I remembered coming home after my seven week long cross-country trip. This time I was coming home to a lot of uncertainty; would I be able to hold on to the truck, would I find another job, would this be the end of my traveling days? A lot of questions with no answers. I wasn’t really thinking about any of this when I approached the Tappan Zee Bridge and I was not prepared for what was to come. About two miles before the bridge my eyes started to well-up and by the time I reached the bridge I was experiencing the worst possible anxiety attack. I pulled over into a parking strip right after the toll booth. My arms and legs started to cramp up, I couldn’t walk, my fingers were tingling, I was breezing rapidly, my body was tingling all over, leg and arm muscles were contracting, nothing felt right. It took me an hour to recover and feel well enough to drive the remaining ten miles to my friend Bettina’s house in Westchester. I was relieved when I arrived. I have been back for about two weeks now and I am still settling into a new routine. The first brief trip to the city was a bit overwhelming. The crowds and noise on the train were more than what I could deal with after all those months away from large cities and mass transit. My good fortunes have not stopped since I have come back to NY. My biggest concern has been to find a way to hold onto my truck. Thanks to Bettina I might be able to do so. For the time being I am camping in her driveway. It is a very nice driveway surrounded by woods and chipmunks on a dead end road. I was able to sublet my apartment within three days for the next couple of months taking away the burden of having to come up with rent money. I am still looking for additional part-time work. I spent four days in the city and fell in love with it all over again. 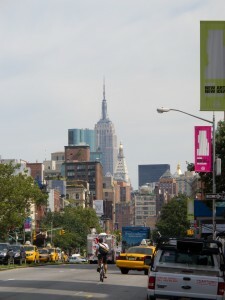 I walked around the Village, Midtown and the East Village. It was great to walk home in the evening up Fifth Avenue, hearing music drifting from Central Park’s Summer Stage concert out to the Avenue. I thought I might see the Alexander McQueen exhibit, a retrospective of the late British designer’s work at the Metropolitan Museum of Art. It was the last day of the exhibit and the Met had extended opening hours until midnight. When I got to the museum the line was out the door and half down the block at 10 PM!, only in New York. I marveled at the Empire State building from Houston Street looking up Bowery, just great and a bagel with veggie cream cheese never tasted this good. Best of all, I now have the wonderful Fairway grocery store in my neighborhood. No need to trek all the way to the Westside anymore. There is no greater city than New York City. Granted it is nothing like the open spaces out West, but the city has so much to offer. For the time being I will be one of those commuters traveling to the city to work.